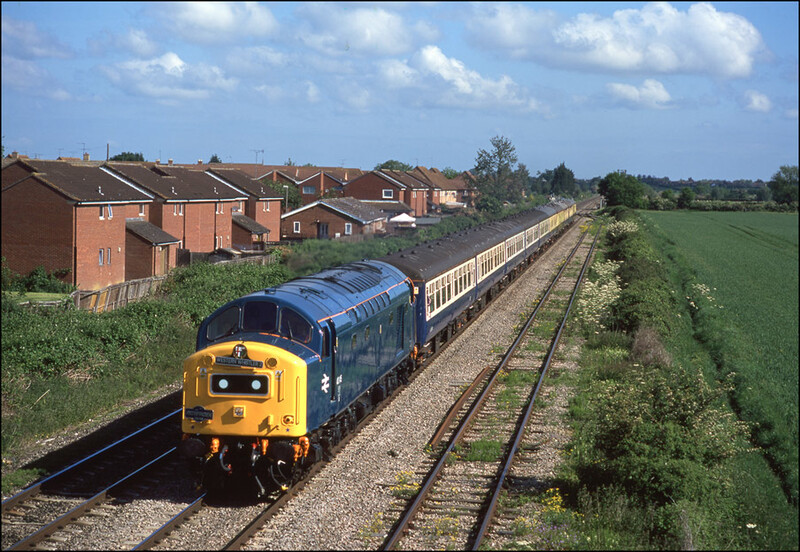 Restored and main line certified 40145 passing Northway, near Tewkesbury on 22 May 2004 with a Crewe to Plymouth railtour. The 40s were just about coming to their end on BR when I became serious about railway photography. I immediately took to these big whistling "buckets" and did get some decent shots of them. Unfortunately, a lot of the images were taken on colour print film although I do have a reasonable number of black and white pictures and some slides, the best of which appear here. As with the 25s, the survivors of the class were largely concentrated in the north-west and this is where most of my photographs were taken. 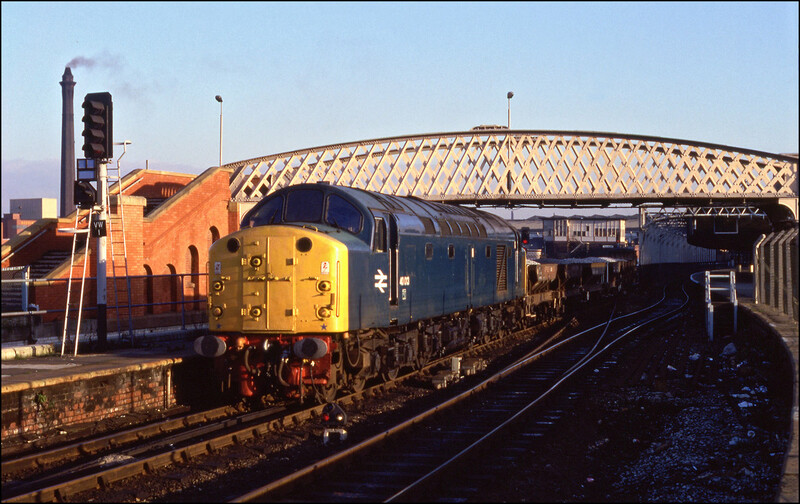 Towards the end of its working life on the mainline 40122 did many special runs and was even employed on one of the Cardiff to Crewe locomotive-hauled diagrams for a few days in May 1987. On the 25th of that month I went to Shrewsbury and instead of going for the usual shot around Sutton Bridge Junction climbed the steps to the ramparts of Shrewsbury Castle where there is (or was - I've no idea what's it's like in 2019) a splendid view over the Western side of the station. This was long before the days of the current fad of taking every shot from a great height, whether appropriate or not, but it did make a change from the usual perspective. Here is D200 about to make the station stop along with 47645 (I think) waiting to leave on a Shrewsbury to Euston express. I mentioned above that D200 worked several railtours and here it is on a such a duty 2 days before the shot shown above was taken. This one was shot at Longbridge as it worked 1Z37 from Crewe to Cardiff, Barry and Oakdale, the Conway Valley Explorer. The light was dreadful but I would much rather have this poorly lit image of the locomotive and train than none; and use the philosophy today. Not all interesting trains run in sunshine. I am well quite known by my friends as having absolutely no interest in football. However, I heard a couple of work colleagues talking on Friday 26 October 1984 about a match the following day between Manchester City and Liverpool to be played at the latter. My ears pricked up and I asked if any special trains were running, aware that a 40 would be a likely choice of power if anything were scheduled. Sure enough there was a special so on the Saturday morning off I went to Manchester Victoria. I was well pleased when 40068 with the ECS appeared coming down the bank from Miles Platting in some lovely sunshine. I wasn't quite as pleased when prevented by a corridor of BRUTES and a cordon of police officers keeping control of an unruly mob of supporters from legging it down the length of platform 13 and onto the former Exchange station for another shot. This was the first roll of slide film I had ever used and seems to have survived quite well over the years. 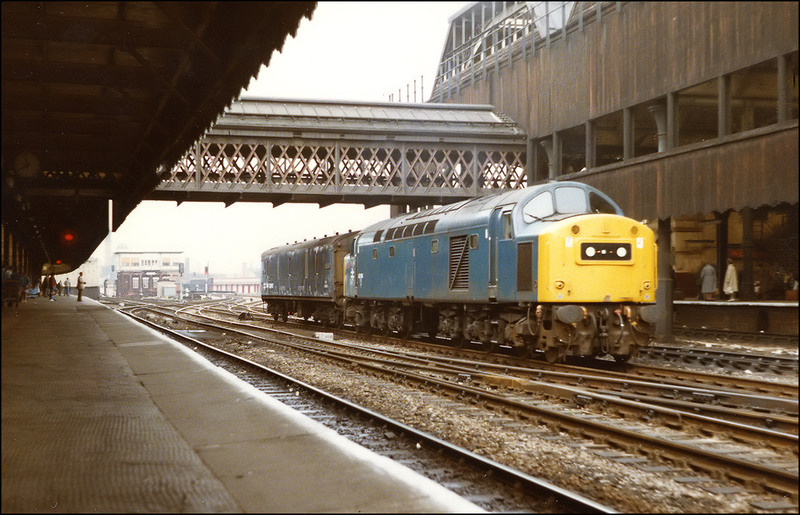 This shot shows 40118 leaving Manchester Victoria with 1P10, the 10.15 train to Blackpool on 1 November 1984. This was a strange working as far as the motive power was concerned inasmuch as it was seemingly allocated anything handy on the day - and sometimes it was a DMU turn. Of as much interest as the train is the fantastic industrial and ecclesiastical background on Manchester. I haven't been there for many years but I suspect that it might not be quite the same in 2018. 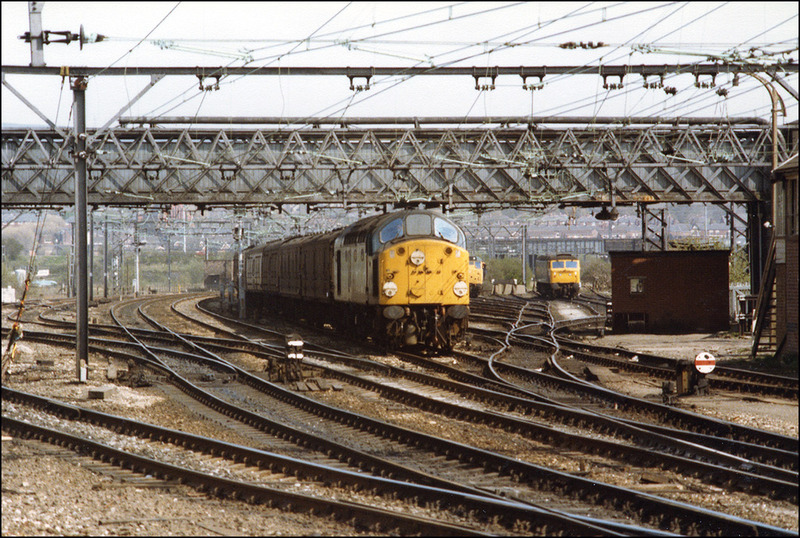 This photograph was taken on 1 November 1984 from the old platforms at Manchester Exchange station and shows 40079 taking a short train of vans to Red Bank. Once again the background really makes the shot and is vastly preferable to me than some green but anonymous countryside. I was quite lucky with the sun all day as most trains appeared in between cloudy intervals - nice to have the luck this way round for a change. Later the same day and in one of the few patches of cloud I saw all day 40009, the last vacuum-braked example of the class, appeared on what a knowledgeable local told me was a westbound ballast train from Guide Bridge. It didn't go far as the loco returned eastwards light engine within an hour. An interesting presursor to high-tech gen lists was to be found at Manchester Victoria. A daily, handwritten list of 40 workings was placed behind one of the toilet cisterns in the gents' lavatories on platform 13 and was updated throughout the day. I found this of considerable use on several occasions, not having any other source of "gen" at the time. 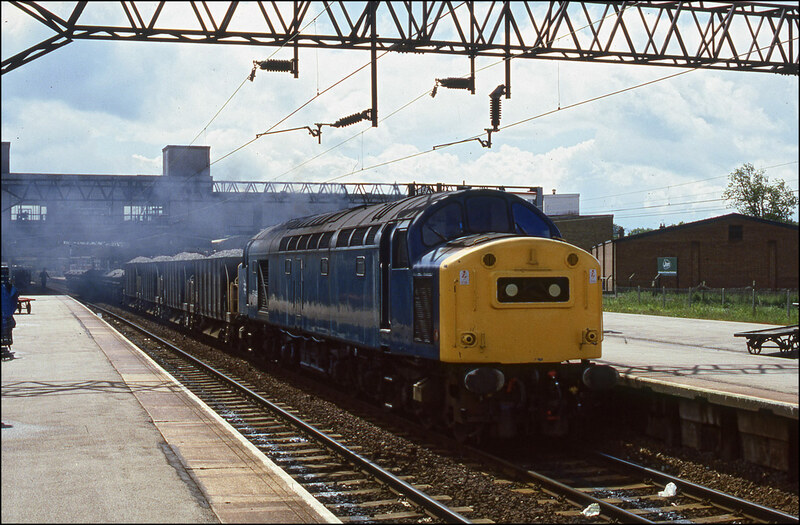 I had just arrived at Stafford on 11 June 1985 when a cleaned-up 97408 (40118) ran through the platforms after arriving with a ballast train from the Stoke-0n-Trent direction. I don't always take light engines but this ws my first sight of a recently withdrawn class 40 temporarily reinstated as part of the departmental fleet. Following its run-round as partly shown above here is 97408 once it had been coupled to the train of ancient looking ballast wagons complete with handbrake handles once used to give extra brake force for unfitted consists on steep banks. Also in view are a class 120 DMU and some BRUTES all of which have disappeared from the railway scene. 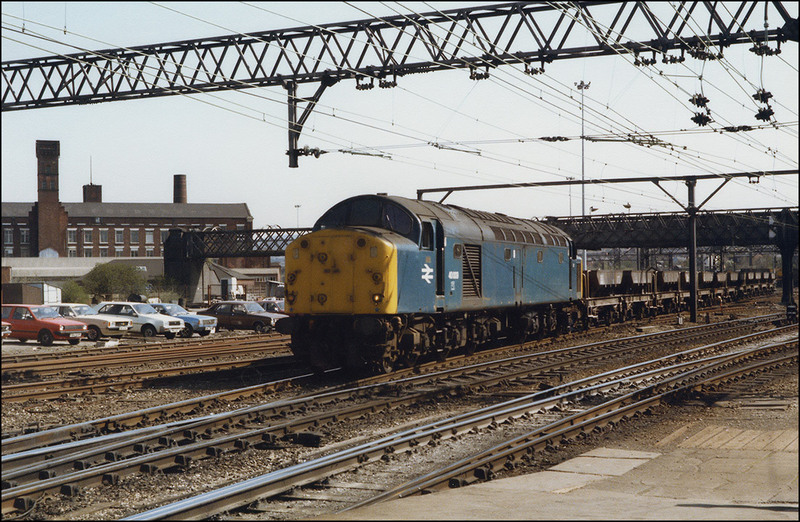 The whole of Crewe station's track layout was remodelled in June 1985 and to help out with infrastructure trains 4 withdrawn class 40s were renumbered as 97/4s and temporarily reinstated to traffic. Here is 97407 (40012) about to head north into the possession with a set of flat wagons topped and tailed with brake vans. One of the results of the Crewe work was that some trains usually starting at Crewe were diverted. This gave the unusual sight of a class 33 starting its journey to Bangor here and here is 33013 waiting for the right-away in platform 6. On the same day as the picture shown above I photographed 97405 (40060) running through Stafford with a ballast from the south. The afternoon backlighting helps to emphasise the exhaust covering the station and gives an impression of the power of these locomotives. 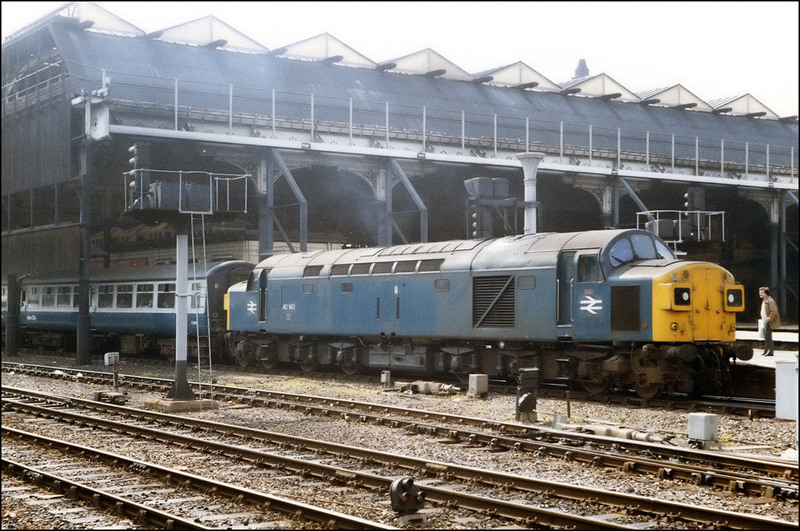 Another of the class 40s kept for departmental use was 40135, renumbered as 97406. It is seen here at Warrington on 17 October 1985 shunting some p-way vehicles in absolutely foul weather which was pretty much the norm I experienced on my few trips to this part of the world, sun being all too thinly spread. Despite the dreadful conditions at Warrington I took another view of 97406 as it continued to shunt some departmental vehicles. 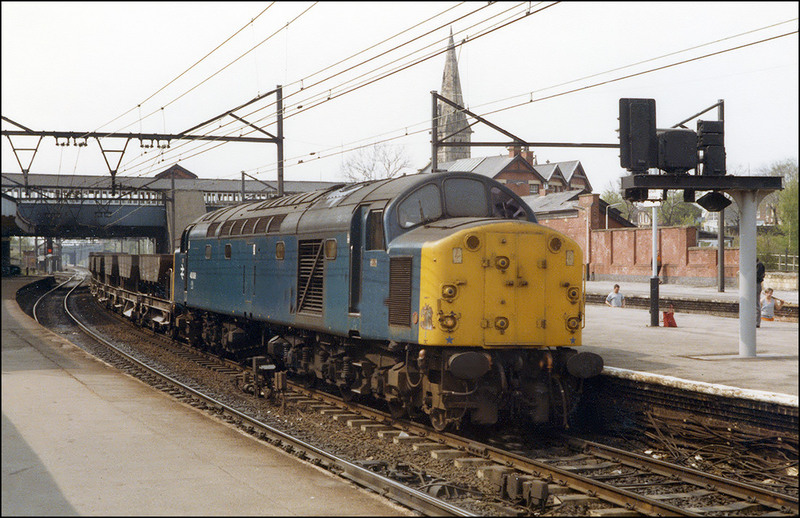 This shot shows to a better extent the length of a class 40 and some of the older architecture of this part of Warrington. The mainline registered 40145 hauled a railtour from Castleton in Lancashire to Stratford-upon-Avon on Saturday 1 October 2016. This was the first time that I had seen a member of the class here although while waiting for 1Z49's arrival was shown a picture of 40078 standing in the ertswhile goods loop on an Adex some years ago. I was mostly interested in taking an image of the train's arrival rather than anywhere else and as the day had been dull and wet thought that a shot from the new bridge as it ran into platform 2 would be the best bet. As I prepared to leave home for the short walk to the station the sun came out fully and stayed out when 172337 forming 2S42 from Stourbridge Junction arrived, also into platform 2 rather than its booked platform 1. This made me wonder if 40145 would go into P1 which, if the sun were out, would be absolutely spot on for the light. It didn't but the sun did find a small piece of cloud at just the right moment and so avoided one of those awful contre-jour pictures which tempt some into over-use of the shadows and highlights tool on Photoshop without altering the parameters governing the tonal width and radius of the settings resulting in very strange and over-processed-looking images. Given the circumstances I was reasonably happy with the result and noticed the faint rainbow in the right background only when uploading the image file. During the week before 40145's trip to Stratford-upon-Avon there were 3 alternative routes suggested for the return to Castleton; 1) to Leamington Spa for reversal with 57313 leading, 2) straight back via the North Warwickshire Line after a double run-round of the 2 locomotives and 3) as 1) but with a reversal at Warwick. Option 3) was selected which gave the chance for a relatively rare view of a locomotive hauled train leaving the Stratford branch at Hatton Station Junction. The leading locomotive, 57313, was making its second visit to the terminus in recent months following a trip from Scarborough on 16 August 2016. I don't often take going-away shots but couldn't resist this one as 40145 trailed the train through the Stratford Branch platform at Hatton on the way to Warwick. After leaving Hatton 1Z50 ran to Warwick where it waited on the up line until Chiltern's 1R45 had passed by on the down line. It then, with 40145 now leading, used the emergency crossover to gain the down line before starting the run up Hatton Bank. The light was dreadful and a wet and muddy walk to Hatton North Junction seemed pointless so I decided on this shot as the train ran through the platforms at Hatton station; an easily recognisable location rather than some attractive but slightly featureless countryside. I'm not one for adjectival excess in photo captions but will say that it was good to see and hear the elderly English Electric locomotive hauling 10 coaches and a dead class 57 climbing the 1/110 gradient with a decent show of exhaust. Pathfinder Railtours ran a train headed by 40145 from Crewe to Llandrindod Wells on Saturday 3 March 2007. The early morning weather in Stratford-upon-Avon was dull in the extreme, but a clear patch gradually appeared in the South West, so I decided to go over to Northway, near Ashchurch on the off chance it would be clear. I tempted fate by packing my 300mm prime lens, a tool for which only totally clear sun will do. Just as 1Z14 appeared under the bridge at Bredon some thin, but very unwelcome, cloud drifted across the sun then drifted away only to be replaced with more as the train approached. Fortunately for me the sun held at the spot at which I was shooting, but sadly for those using standard or short telephoto lenses there was some shadow nearer to the bridge. 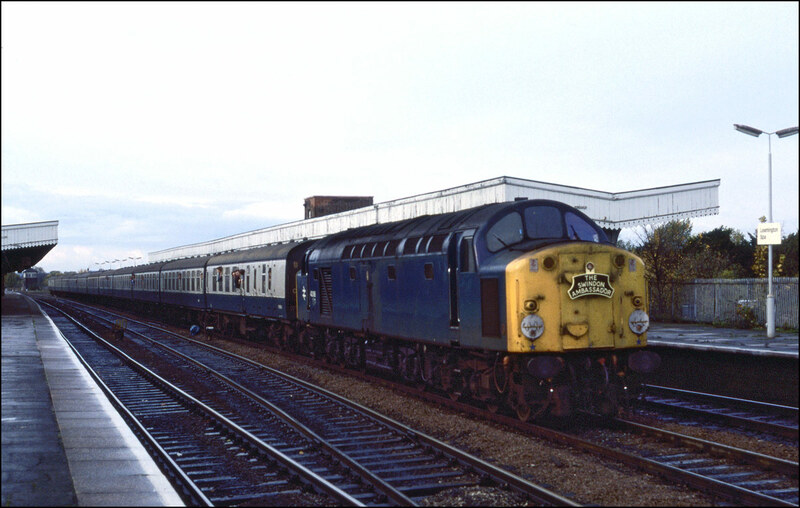 Towards the end its main line career, 40122, generally referred to as D200, was in demand for railtours. 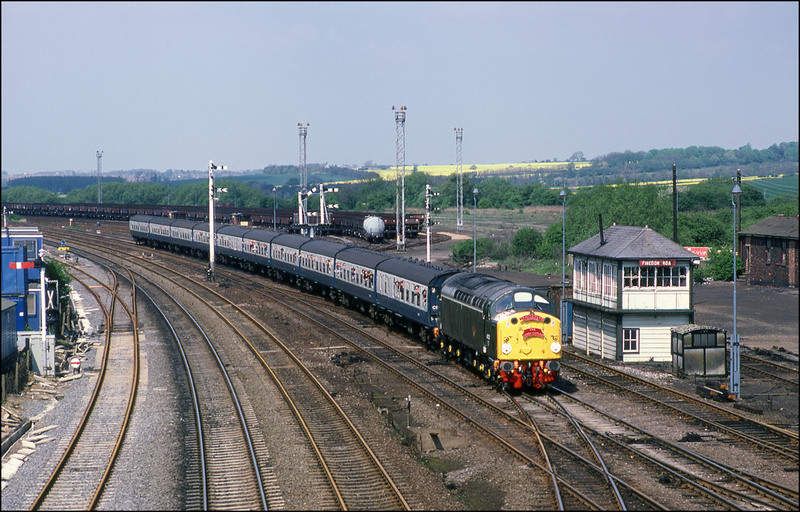 On 4 May 1987 the locomotive was used on a Traintours Charter, 1Z26 from Preston to St Pancras routed via Corby, hence the headboard, "The Corby Cutler". Here is the train passing the yard and semaphore signals at Finedon Road, Wellingbourough. The up main line north of here was out-of-use through engineering work at the time, as can be seen from the rust on the tracks, and D200 is seen leading its train off the up relief and onto the main shortly before passing through Wellingborough station. 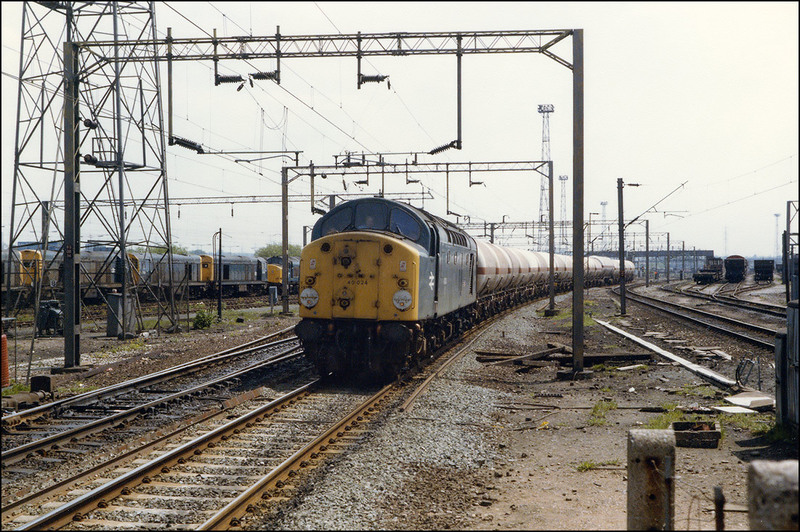 By May 1984, class 40 workings into the West Midlands were getting a bit thin on the ground so when one did appear it was a red-letter day. I was at Bescot on 30 May and was, to say the least, quite chuffed when 40024 appeared on a rake of LPG tanks. Note the one large bogie tanks amongst the other 4 wheel tanks. The train is almost certainly the WFO Rowley Regis to Stanlow working, Rowley Regis being on the line from Galton Junction to Stourbridge Junction. There were several oil and gas receiving terminals there at this time but all trace of them has now gone. Thanks to Andy Williams and David Hayes for the train ID. This picture sums up for me the atmosphere of the cavernous interior of Manchester Victoria on 29 May 1984. The only sound disturbing the calm is 40194 gently whistling through the centre road hauling a single NPCCS en-route to Red Bank sidings. There can have been very few stations in which so much wood was used for contruction - the galleried effect of the canopy to the right of train gave a great feeling of the size of the place. I loved taking photographs both in here and a little further out on the platforms of the former Manchester Exchange station, sadly now all gone. 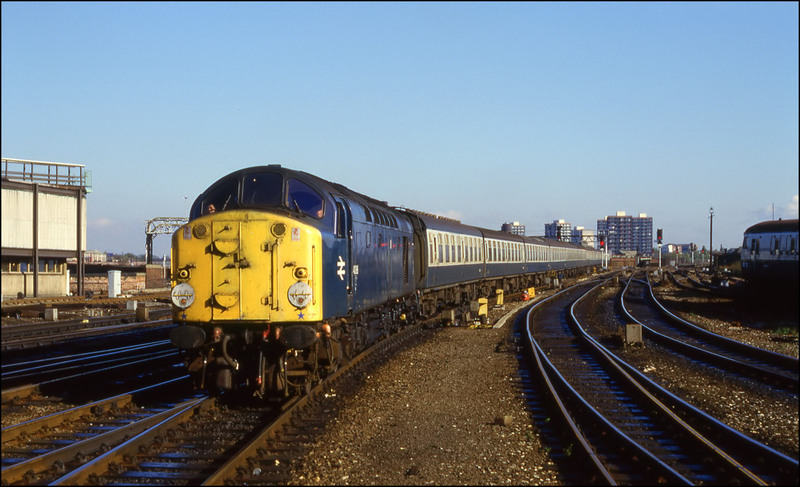 Class 40 did not have any booked passenger workings in May 1984 but this did not preclude their use on such services. 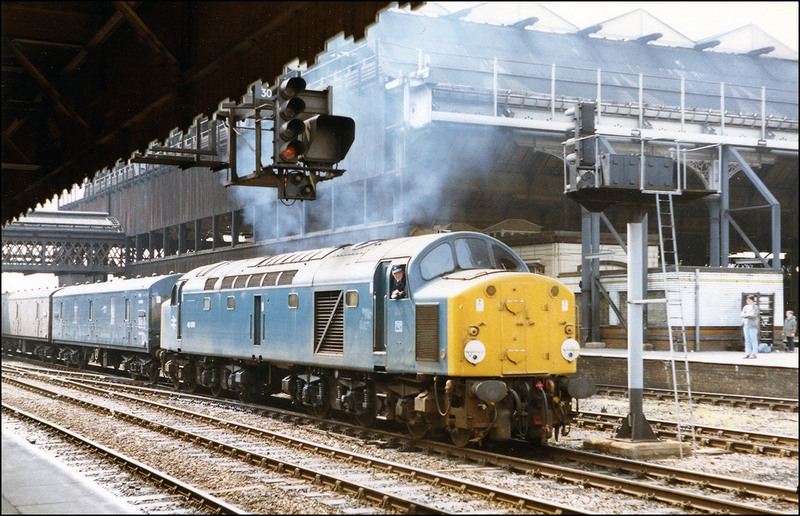 One of the jobs which seemed to turn up the occasional whistler was a Liverpool to York train as shown by this picture of split headcode 40143 leaving Manchester Victoria on 29 May of that year with a front coach full of bashers looking forward to the thrash up Miles Platting bank and thence across the Pennines. Not long after 40143 as shown above had departed for York, 40079 came through the middle road and stopped at the signal to allow a DMU to proceed. Once the section was free the signal cleared and 40079 roared into action with a train of empty newspaper vans heading for Red Bank sidings. I do wish it had been practical to take video recordings in 1984, the only cameras I saw then were the size of a small car and probably cost about the same, as the noise this locomotive made as it acccelerated away sticks in my mind even to this day. I paid a couple of visits to Guide Bridge, near Manchester, in the middle of 1984. I had heard that this was a good location to photograph class 40s along with many other classes of locomotive on freight traffic. On 2 May I took this picture of the last vacuum-braked 40, 40009 heading east through the station with a short rake of ballast hoppers. The scene here has changed beyond recognition and has lost the enormous character that was present in 1984. The line was electrified at 1500 volts DC and the passenger service used the vintage class 506 "Hadfield" units . I always enjoyed the ride in these from Manchester Piccadilly; the ride was similar to the class 304 "dinosaurs" used around Birmingham. 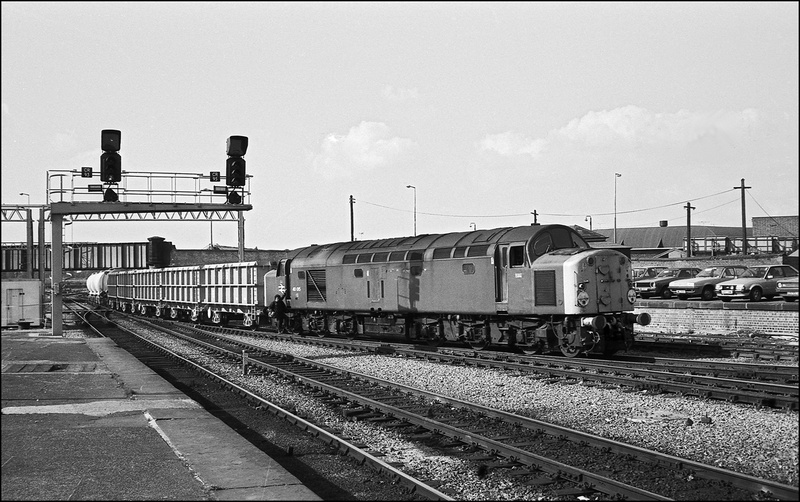 This picture of 40009 was taken at Guide Bridge on 26 April 1984 as it propelled a ballast train from the east into the CCE yard in the background. There seemed to be a freight or infrastructure train every few minutes here and I remember using an awful lot of film on my trips here. 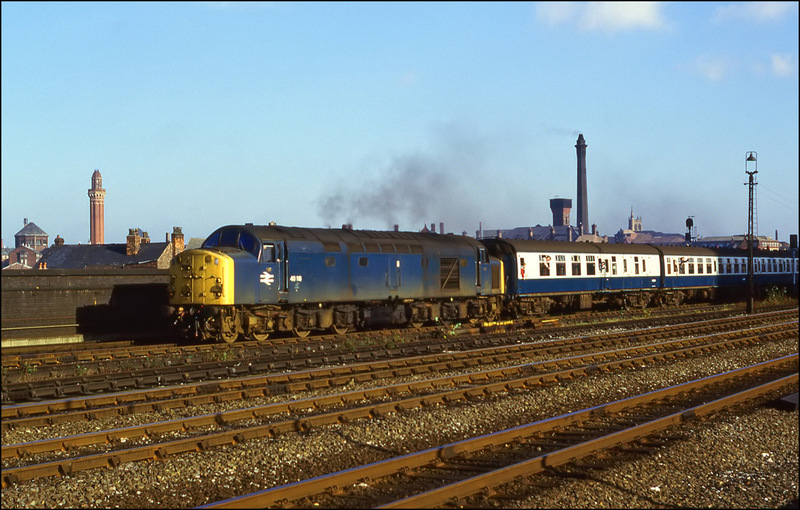 Everything was rail blue, and in retrospect it seems a lot more civilised than some of the liveries around today, many of which appear to have designed by colour-illiterate marketing monkeys. Another class 40 to appear at Guide bridge on 26 April 1984 was 40118 on a long rake of newspaper vans. I deliberately took this picture from the eastbound platform even though the sun was still on the other side of the train in order to show some of the large yard and other infrastructure more clearly. A 47 and a 31 are visible in the yard, having earlier worked through light engine. A crew change took place in Guide Bridge station and it was good to stand and listen to the whistle for a few minutes while the new crew settled in to the locomotive. 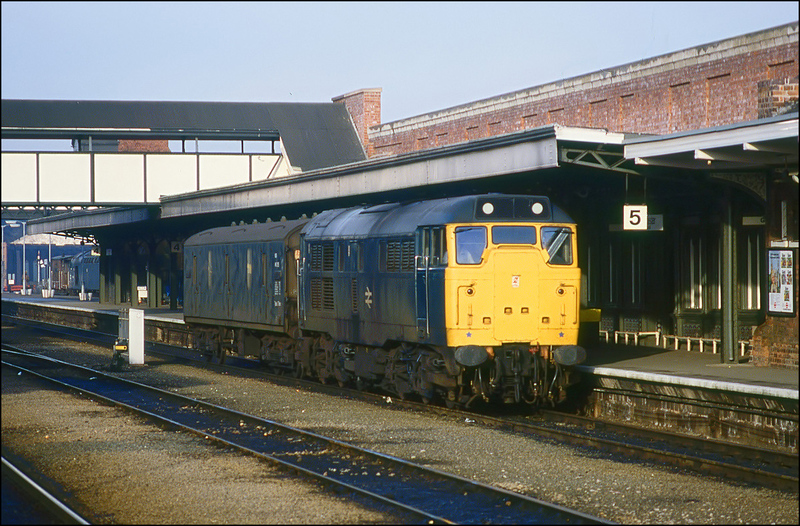 By November 1984 the chances of seeing a class 40 in action on the Birmingham to Leamington Spa line were virtually nil. It was therefore with some anticipation that I looked to the passage of "The Swindon Ambassador III" railtour on the 3rd of that month. 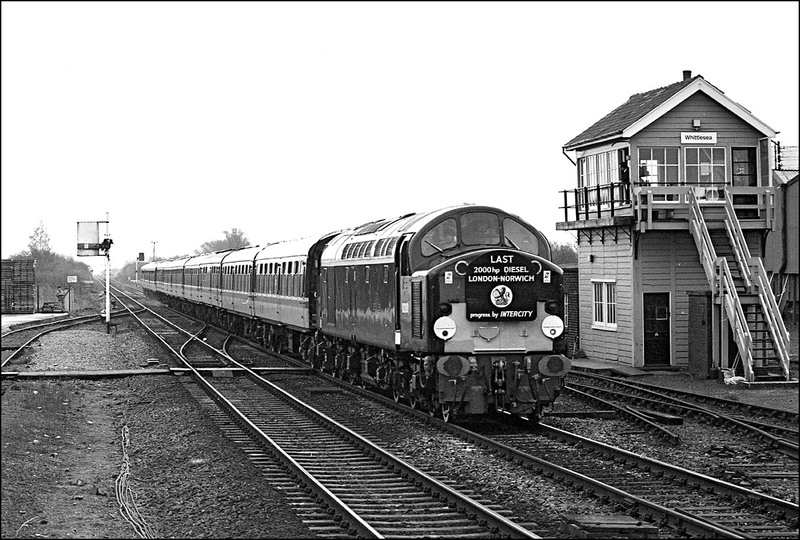 The train was run by the Lancashire Locomotive Society and employed 40086. It ran from the North West to Derby via Uttoxeter where it reversed and thence to Birmingham, Oxford and Didcot for a visit to the Swindon Works. The locomotive ran out of fuel at Didcot and had to be taken to Reading by 58017 for the tank to be replenished. It was an especially dark and dank day, hardly ideal conditions for the Ektachrome 100 film I used at the time, so I chose to go to the station at Leamington Spa where it would be going reasonably slowly or, as happened, stopped to allow a scheduled passenger to overtake. 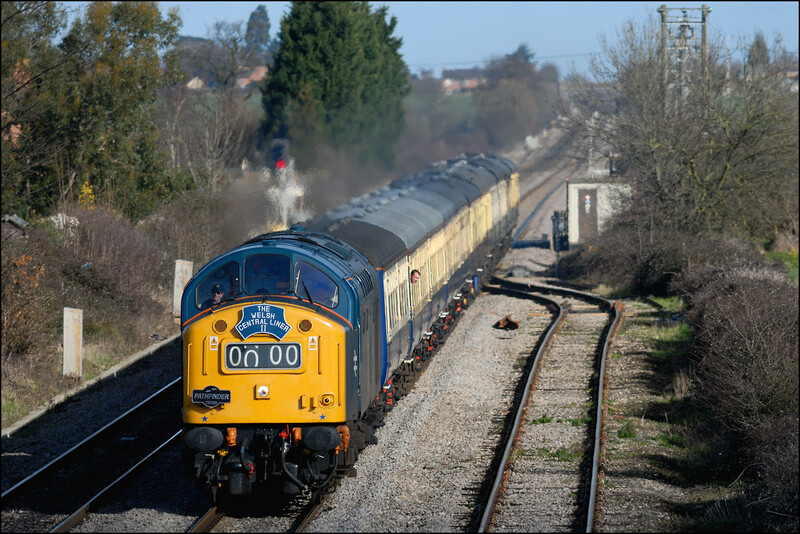 The running in 2006 of a railtour with the title "Christmas Cracker" using the beautifully restored 40145 reminded me of the original tour which ran on 15 December 1984. Here it is, with 40118 in charge, passing Worcester Shrub Hill station with the locomotive being given a large handful of regulator as the curve at the Birmingham end was cleared. 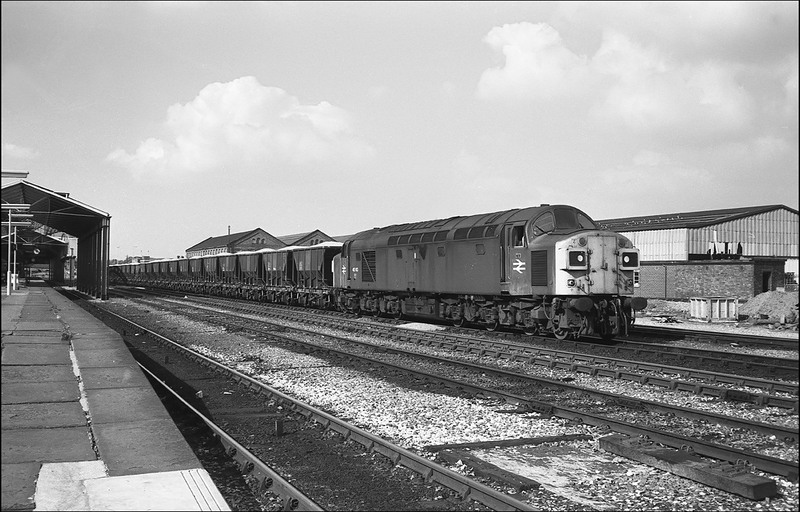 Class 40s were not unknown at Worcester as occasional visits were made with the vans from Birmingham Curzon Street which conveyed parcels for a local catalogue company. 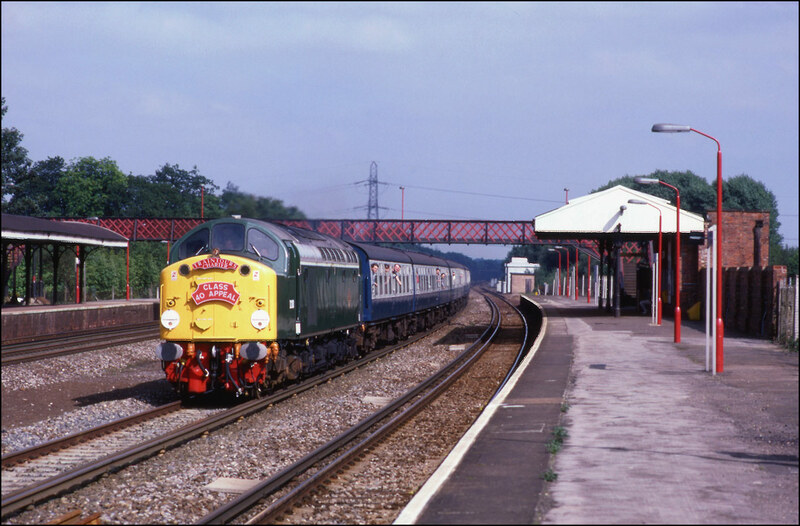 I don't have any good photos of this, but do recall seeing 40044 on the job one Saturday morning. 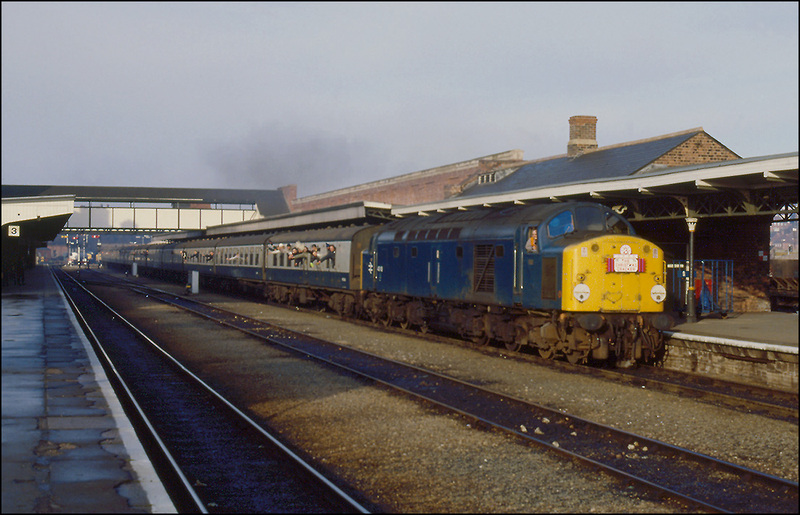 Click on the hyperlink to see a shot of 31289 on 3V16 taken on the same day as 40118. 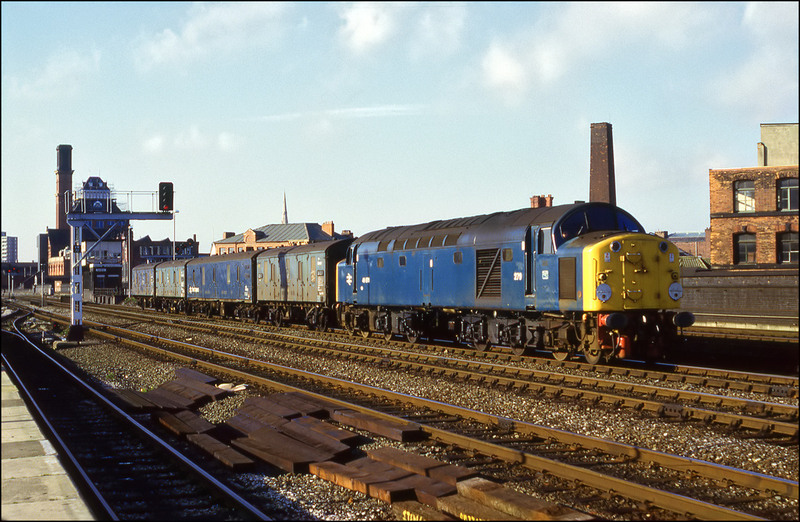 The next picture is dated 6 December 1984 and shows 40013 headed west through Manchester Exchange with a rake of ballast wagons. The picture was taken from the start of the illicit walkway mentioned in some detail in the class 45 section (45069). The loco had been withdrawn and reinstated at this time and was destined to become an exhibition locomotive - hence the cleaned-up state. 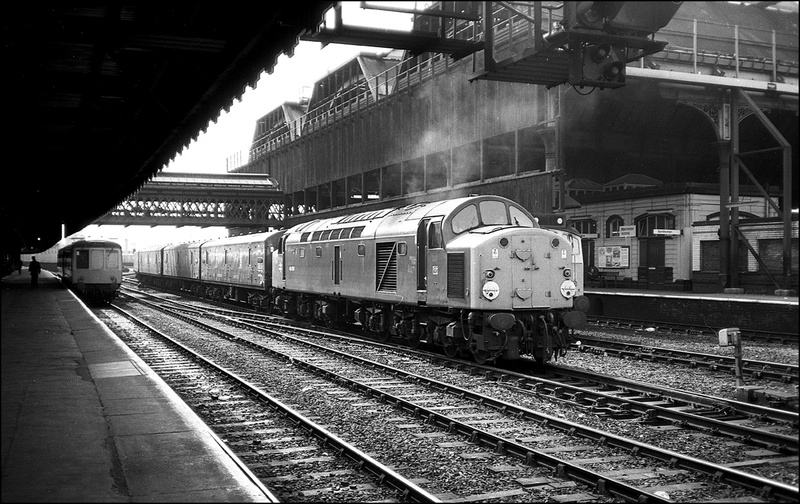 This black and white shot was taken inside Manchester Victoria on 25 October 1984 and shows 40079 on a train of vans heading for Red Bank. The loco clearly liked this job - see the colour shot of a similar train above. Here is a picture of 40015 entering Chester with a mixed freight consisting of scrap wagons and some tanks. 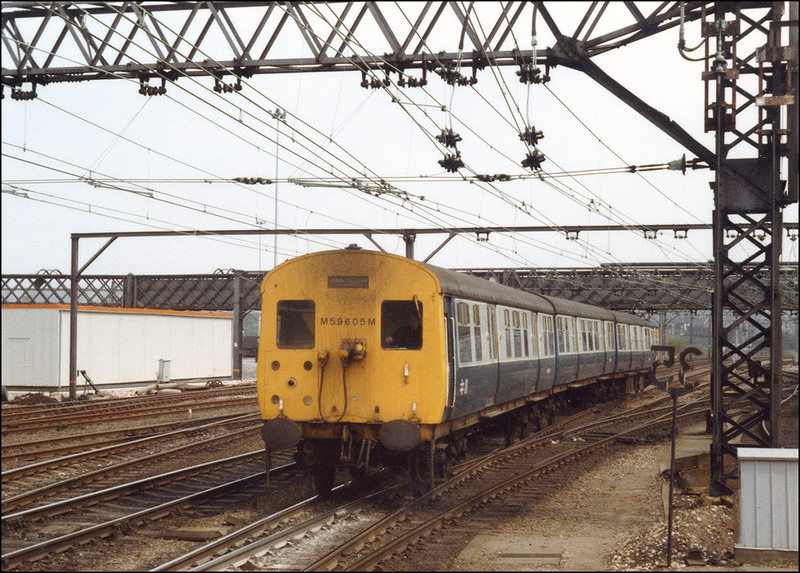 It was taken using a 35mm compact camera on 26 September 1984 whilst I was on a week holiday using a �7.50 Midland RailRover ticket. Chester was the most northerly point at which these great value tickets were valid. 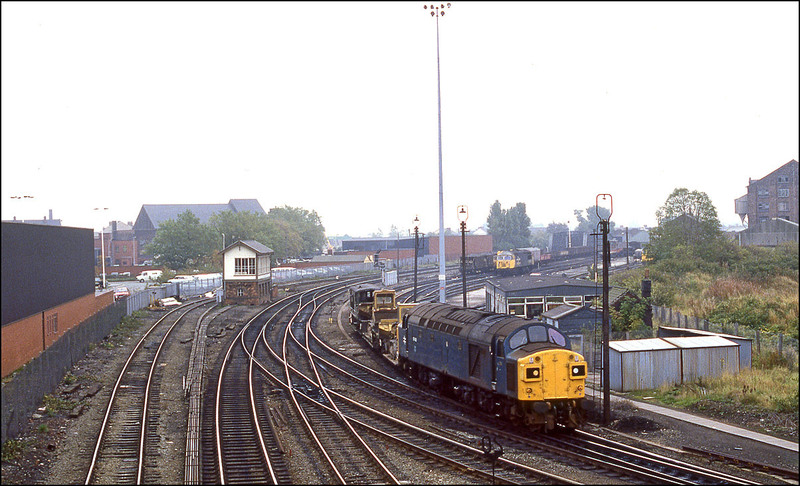 Another picture taken at Chester on 26 September 1984 showsn split headcode survivor 40143 with a lengthy ballast train, which presumably had originated at Penmaenmawr quarry in North Wales. 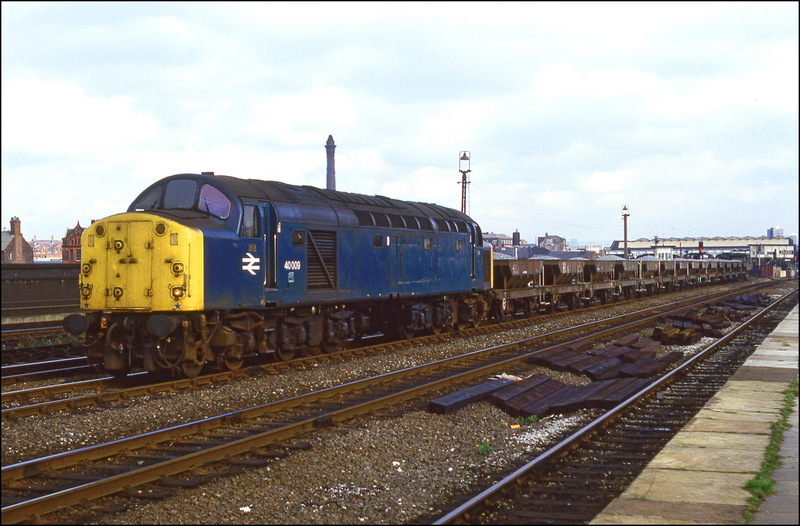 The pioneer class 40, D200 was often in demand for railtour duties and on 31 August 1987 was requested for 1Z37, "The Desert Songster". This tour started at Preston, ran to Kensington Olympia from where a pair of 73/1s took it to Waterloo. D200 again took charge and ran along the LSWR to Exeter. My choice of location was Winchfield where the train running nearly an hour late. The loco was audible long before it came into view and I can honestly say that I had never seen a class 40 moving so rapidly. I'm not sure how the bashers could breathe so fast was the train going! D200 led a charmed life for nearly 3 years after the withdrawal from active service of the rest of the class. The final run came on 16 April 1988 when it covered a lot of its old ground from Liverpool Street to Norwich and then via Peterborough to York where she was handed over to the NRM collection. This picture, taken in pretty awful light, shows the train passing Whittlesea station on the March to Peterborough line.